Magnetic lows over the Hellas (left) and Argyre impact basins on Mars. Superimposed on the topography are the peak shock pressures, in gigapascals, estimated to have been produced by the impacts. A new study of old rocks on Earth could force a revision of theories about Mars. The results suggest ancient Mars might have been more magnetic than thought, challenging basic assumptions about the evolution of the red planet. Unlike modern Earth, Mars has almost no magnetic field today. Evidence has suggested Mars didn't have a very strong magnetic field early on, either. Our planet's magnetism is created by the rubbing of a solid inner core against a liquid outer core, which rotate at different rates and act as a dynamo. The magnetic field helps deflect cosmic radiation and solar particles, making Earth comparatively more habitable. Magnetism is recorded in the structure of rocks. Superheated material, when it cools, takes on a structure parallel to the prevailing magnetic field at the time. A planet's magnetic activity changes over the eons, in part because a young planet cools and solidifies as it ages, so ancient bedrock can serve as a time capsule for magnetism, a sort of fossil compass. A study in 2003 found the core of Mars, at least the outer part, is liquid. Surveys in the 1990s of magnetic fields on Mars, by the orbiting Mars Global Surveyor, detected the signatures of relatively intense magnetism in some of the planet's more modern surfaces. But the fields were found to be very weak in two large and old impact basis, called Hellas and Argyre. Each basin, carved out by a colossal space rock, is more than 3 billion years old. The data implied that Mars had a weak magnetic field back then. That analysis has influenced theories of how Mars cooled after its formation and when its inner layers developed distinct boundaries. The new research calls into question the validity of measuring magnetism from an orbital perch. A team led by Stuart Gilder of the Paris Earth Physics Institute found that rocks in the 2-billion-year-old Vredefort impact crater in South Africa -- the oldest such structure on Earth -- are highly magnetized, yet from above the magnetism appears weak. Two other ancient craters reveal similar differences. The basic reason is simple: While magnetism is strong in individual rocks, the direction varies from rock to rock in these impact craters, so when examined from a distance, they cancel each other out. The study is detailed in the May 12 issue of the journal Nature. "Meteorite craters can then seem to be magnetic or non-magnetic, depending on how close the magnetometer is to the source," writes David Dunlop, a University of Toronto researcher, in an accompanying analysis. 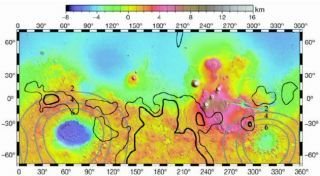 "Viewed from satellite altitudes of 100-400 kilometers [60-250 miles], martian impact basins would appear magnetically featureless if the magnetic vectors of their source rocks vary in direction over distances of a few kilometers or less." Exactly why the rocks are magnetized randomly is more complicated. Based on differing mineral structures in the rocks, Gilder and his colleagues hypothesize that when a space rock hits, the shock of the event would briefly create intense localized magnetic fields. Rocks that cool during this initial period would be magnetized with orientation related to these temporary field. Other rocks would cool more slowly, and would take on the planet's magnetic orientation.